Card reading: New growth, tender and fresh, must be tended and cared for. 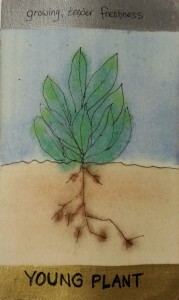 This card was drawn in the reversed position, which indicates that this new growth is inside you. Feel for a new opening, some kind of vulnerability, perhaps inner child essence returning home. It’s important to be kind and tender with yourself. Treat yourself like your own best friend, or even better, a long-lost child returning home at last. If you feel scared or uncertain, if there is something you don’t feel like doing but ‘should,’ do not pressure yourself. Give yourself lots of slack and take time to treat yourself to special time. A hot bath, a long walk on the beach alone, curling up with a good book, a tasty meal; whatever it is will be different for everybody, but it should be the thing you really feel like doing but perhaps don’t think you deserve or have time for. You totally deserve it! And you can make the time, it’s not hard. Just know that you are precious and vulnerable, worthy of caring for. This is just a small sample of what you can expect from a card reading, using a single card. A normal reading uses a minimum of twelve cards, read in layers. Contact me to find out how you can receive your own reading, in person or over Skype. Card readings are enlightening and fun! I have an 8 dergee natal Venus and 7 dergee natal Chiron in first house Sagittarius. Today, I had some of the best news I have received in more than 3 three years. At present, Neptune and Chiron are transiting my fourth house. Was I too quick to see something positive or was it really all an illusion .